You are here: Home / Diary / Favourite Things Award! My fluffy orange pal Simba gave me the Favourite Things Award about a week and a half ago. Thanks, Simba! The award, which originated with Nerissa (hence the Canadian/ British spelling of “favorite”), asks that the recipient list six of their favorite things and then pass the award onto other bloggers. I’m usually pretty bad about posting awards, but I tried to be better this time… so here goes! 1. Chicken! Especially KFC chicken. 2. Getting brushed! I think it is heavenly. 3. My Tickle Pickle toy. 6. Saving other kitties’ lives. I am supposed to pass this award along to other friends, but I am afraid that by now, many of you already have it! If you don’t, feel free to take it and make up your own list of things you like! Okay… I’m like… REALLY late in finding this. What… almost three months late? MOUSES! I have GOT to get my paws in gear, here. Congrats on your award, Sparkle! 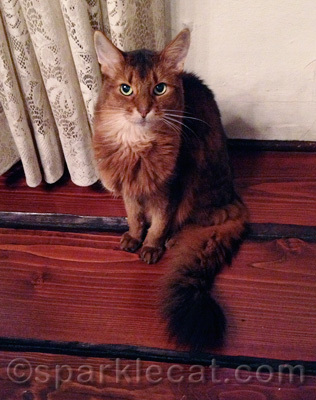 We liked the look on your face in “Supervising My Human.” MOL! Why Sparkle! This is a wonderful post–and I could not agree more about #2, #5; of course, I brim with admiration about #6 but my Human is alas not as active in this regard as yours. Your Lady does good, Sparkle, you should be a lot nicer to her. Congratulations on your award. Truffle agrees with you about the tickle pickle. She loves hers! ConCats on that nice award!! We like all of your favorite things!! That’s a lovely list! Bossing Binga must be #7. Concats! Concats! 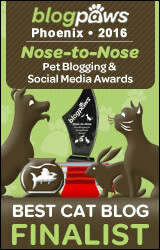 I never pass awards to you cos I figure you’re too busy saving kitties to blog about mere awards. I’ve never seen KFC. The only fried chicken place around my house is Popeyes. Congrats on the award. 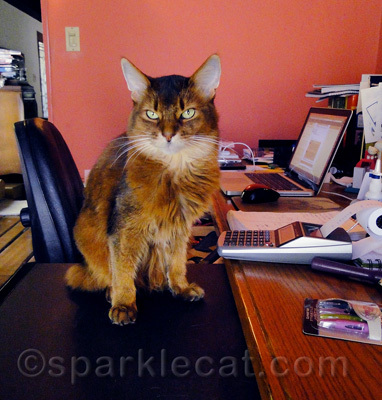 Sparkle looks gorgeous in the “Supervising my human” picture. Very fun and interesting choices for the list. Congrats and we share my of your faves and being an ex-pat Canadian loved seeing the word favourite! And those are great things on your list especially #6! Congrats Sparkle! I loved your list, escecially #6!!!!! Concatulations Sparkle! 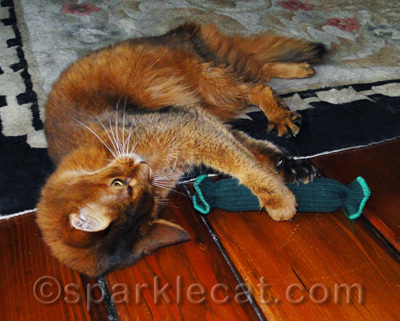 We like all your favorite things, except the brushing, but we especially like the saving other kitties part! 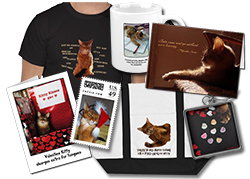 You and your human deserve lots of kudos for the work you do on behalf of kitties! Congrats on your award. The things you like made me smile. Concatulations on your award! Those are all wonderful things to like. Concats on the award Sparkle!! I love your six fave things……some of your six are my six too!! 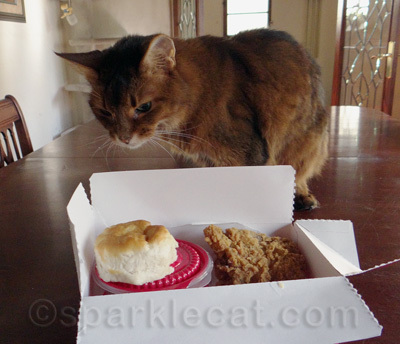 OMC, I love KFC too, Sparkle! Great list Sparkle and concats on the award! Concats on your award, Sparkle! Those are some of our favorite things too, especially the chick-hen! Congrats on your award, Sparkle. Those are great favorite things, ‘specially the saving cats’ lives. Congrats on your awards. Love the pictures with your favourite things to do. Well done. Take care. 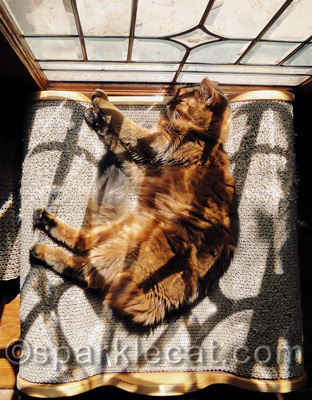 Concats, Sparkle. 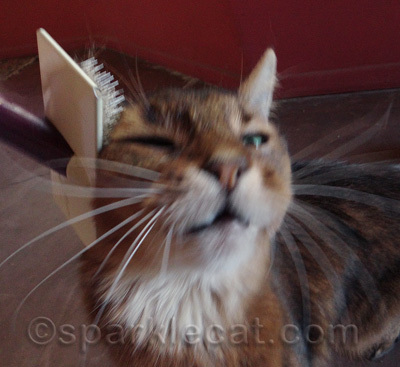 We love the blissful look on your face in that brushing photo. Congratulations Sparkle! What wonderful favorite things! 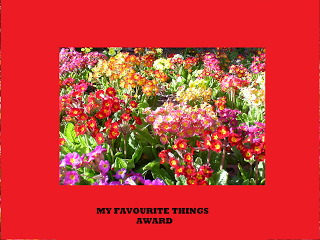 Concats on your award Sparkle and what great favourite things.